A “friend of the court” amicus brief was filed at the end of last month (November 26) by PEN America, urging the Sixth Circuit Court of Appeals to recognize Americans’ constitutional right of access to literacy. 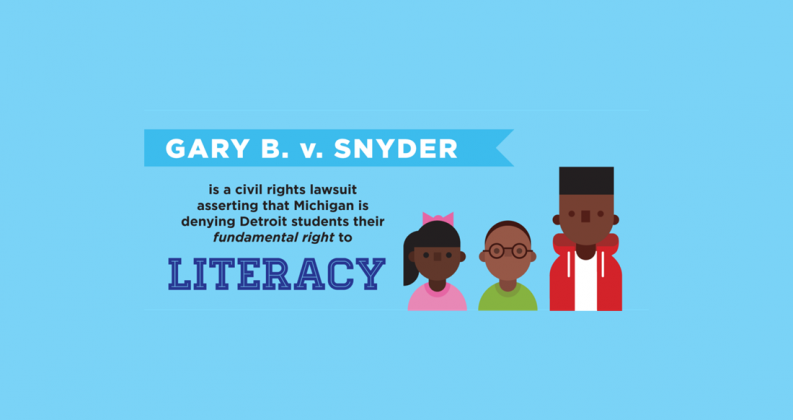 PEN America filed the brief in the case of Gary B v. Snyder, in which students at Detroit Public Schools have brought suit against the state of Michigan for a failure to provide what they assert are basic educational standards necessary to ensure that these children have a functional level of literacy. In the suit, the students describe the conditions of their education as including unsanitary and dangerous situations, an absence of appropriate textbooks or other reading material, and overcrowded classrooms. As a result, many of these students assert that they’re unable to read, write, or process written material at anything approaching grade level. 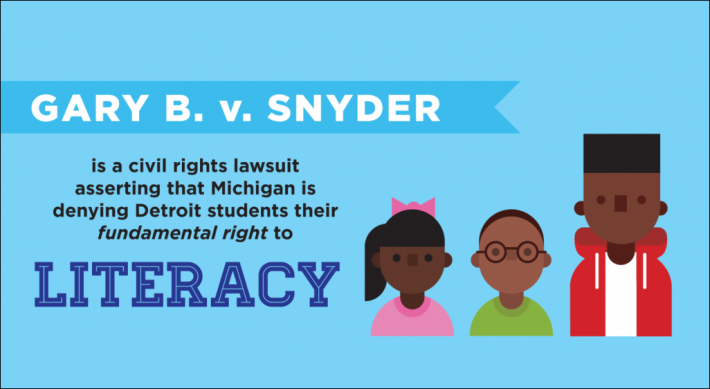 The United States District Court for the Eastern District of Michigan dismissed the students’ suit in June—as is covered by Stephen Sawchuk at Education Week. And the case now is on appeal before the federal Sixth Circuit. The amicus brief also stresses the economic challenges involved, its text stating that people “who lack literacy are far more likely to be low wage workers or unemployed and to rely on public financial aid. Their inability to get by will be exacerbated as the economy continues to move away from low-skilled jobs. PEN America refers to two of its original research reports—Missing from the Shelf: Book Challenges and the Lack of Diversity in Children’s Literature (covered here by Publishing Perspectives) and Faking News: Fraudulent News and the Fight for Truth—to argue for the essential role of literacy. US literacy rates, the filing asserts, “have made little progress in the last few decades,” with the rate between 2012 and 2014 not showing significant improvement over where it was between 1994 and 1998. The filing also draws a connection between literacy and the ability to recognize fake news, the PEN attorneys writing, “PEN America’s October 2017 report, Faking News: Fraudulent News and the Fight for Truth, details the alarming inability of many Americans to understand the difference between accurate reporting and fraudulent news or advertising, and the threat it poses to American democracy, which requires an informed and engaged electorate. In a prepared statement, James Tager, PEN’s deputy director of free expression research and policy, is quoted, saying, “The complete failure of the state of Michigan to ensure a basic standard of literacy for these students is not only an outrage, it is also unconstitutional. “PEN America has championed the freedom to write and to read for almost 100 years, and we recognize that this freedom to read is inextricable from the right, firstly, of access to literacy. PEN America—which has merged the former two PEN chapters in the United States—was founded in 1922 and today has more than 7,000 writers and their supporters as its membership. It’s the US chapter of the PEN International movement.